Congratulations! You're in love, you've set a wedding date, and soon you will be married. Between the romance and the ritual, however, you must survive a potentially life-changing challenge: planning your wedding. Think of yourself as a project manager. Establish an overall framework for completing the work, and set specific intermediate deadlines, schedules and goals. Taken one small step at a time, the detail-laden job becomes less overwhelming. Here is our suggested timetable for the steps you should take in the months, weeks and days leading up to your wedding. Think about colors and themes. Compile clips and photos of things you like. Choose your wedding date & time. Select and reserve your reception site. Select the site for the ceremony. Select and book all entertainment for the wedding: band, DJ, soloist, musicians, vocalist, pianist, etc. Prepare a first draft guest list. 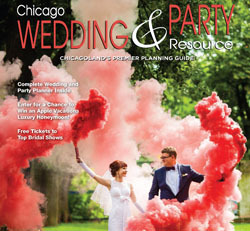 Interview wedding planners and decide whether to use professional help in planning your wedding. Ask your family and/or friends for their assistance where needed. Announce your engagement in local newspapers. Send "Save the Date" info to out-of-town guests. 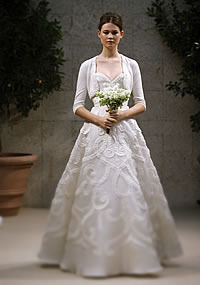 Shop for your Bridal attire. Review your budget and make a final determination regarding who is paying for what. Determine the theme, mood and colors to be used for your wedding and rehearsal dinner. Interview and schedule your photographer/videographer. Choose the officiant for your wedding. Set up tasting appointments with caterers, make your final catering choice and schedule them for your wedding day. Set up a future appointment to discuss final menu selections. Establish wedding website for keeping friends and out-of-towners informed of plans. Select theme and colors for your wedding. 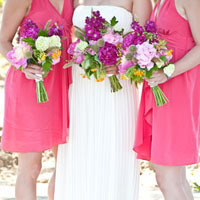 Finalize floral decisions for your wedding, reception, bouquets and corsages. Check on marriage license requirements. Set up tasting appointments with bakers and order the cake and/or sweet table. Assist mothers in selecting their dresses/accessories. Shop for the groom and groomsmen's attire. Select wedding invitations and stationary for thank yous. Order any other imprinted items you may need for the wedding, guest towels, matchbooks, etc. Decide on how your invitations will be addressed (by hand or by computer). Hand written invitations: set appointments with a calligrapher and choose the style for your invitations and reception placecards. Shop for remaining accessories you need to complete your wedding day attire. Select a hotel and reserve accommodations for out-of-town guests. Make arrangements for a morning after the brunch for out-of-town guests either at the hotel or the bride's and/or the groom's home. If the breakfast is scheduled at home be sure to hire a caterer and finalize a menu. Select a site for your rehearsal dinner and finalize menu and guest list. Decide on transportation for the bridal party for the ceremony and reception. At the same, time check on transportation for out-of-town guests and make any necessary arrangements. Reserve any rental items you may need: tables, chairs, tents, dishes for the rehearsal dinner, ceremony, reception and/or brunch the morning after the wedding. Select and order reception favors, candy, nuts and any other extras you may want such as: cameras for guests to take informal photos, rose petals to shower the bride and groom, etc. Select music for your ceremony and reception. Choose any readings for your wedding and/or write your wedding vows. Finalize all plans for your ceremony. Meet with officiant and discuss your ceremony plans. Make appointments for gown fittings. Double check all contracts and arrangements. Be sure everything is complete with all of your service providers. Select a special stamp for your invitations and reception response cards at the post office. Address invitations or take them to the calligrapher for addressing. Prepare directions and easy to follow maps to help guests find their way to the ceremony and reception. Secure all your honeymoon arrangements incuding passport and vaccinations. Select any welcome packages you want to put together for out-of-town guests. Include information on things to do in the area including local restaurants. Include snacks, bottled water, fruit juice, fresh fruit, nuts, candy and any other items you feel they may enjoy. Make arrangements with the hotel to hand these out when the guests check in. Select gifts for attendants and groomsmen. Select gifts for each other. Select rehearsal dinner invitations and thank you notes. Shop for your trousseau: beautiful new lingerie for your wedding night and honeymoon, as well as any clothes you may need for the type of honeymoon you've planned. Double check attendant's attire/accessories and see that they have made appointments for fittings. Make a date with your photographer for any formal portraits you desire. Schedule an appointment to meet with your hairdresser to discuss how you will wear your hair on your wedding day. Be sure to bring your veil and/or headpiece. Mail out invitations to your wedding including response cards with pre-addressed and stamped reply envelopes. 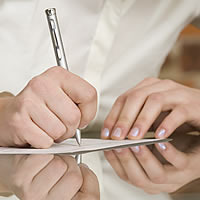 Write thank notes for any shower gifts you have received. Schedule a Spa Day for yourself and your attendants — a day of beauty before the wedding with hair styling, manicures, pedicures, massages, facials, and makeup sessions. Make appointments for mothers' hair appointments. Plan a luncheon or party for your bridesmaids. Gather necessary birth and baptismal certificates you may need for your wedding license and/or your passport if traveling out of the country for your honeymoon. Reconfirm date with all vendors. Mail out invitations to the rehearsal dinner to your attendants, family and out-of-town guests. Complete all documents for changing your name. Have a final fitting of your gown. Check with each attendant to make sure they have their dresses fitted and accessories purchased. Keep track of wedding gifts as they arrive. Draw up seating charts for guests at the reception, number the tables and discuss with the florist how the numbers will be displayed on the tables. Have your calligrapher add the table numbers to the place cards for reception guests and rehearsal dinner. Confirm locations for coat check, handicap accomodations, guestbook, gifts, group photographs, etc. Confirm date and time of floral delivery with florist. Meet with your photographer to specify the formal shots you want taken of the bridal party and family, as well as specific candid shots you'd like taken during the reception. Review plans for your video with your videographer. Pick up your wedding rings and check engraving. Start packing for your honeymoon; don't forget those golf clubs, skis, sunblock, swimsuits, and other special items required at your destination. Wrap gifts for your attendants and groomsmen and for each other. Make that one last check with your vendors: officiant, musicians, florist, caterer, reception site, transportation providers, rehearsal dinner site, cake, etc. Have checks written for all vendors to hand out at the appropriate time. Check with hotel to make sure all of the out-of-town guests arrangements are secured. Ask a friend or family member to arrange wedding gifts that may be brought to the cermony and/or reception site, and to then transport them to your home. Contact any guests that did not respond to your invitation. Inform your caterer of the final guest count. Make final seating changes to your seating charts and make sure there is a placecard for everyone. Wear your wedding shoes at home everyday to make sure they are comfortable on your wedding day. 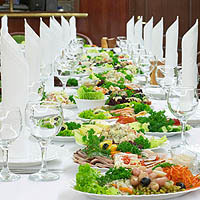 Host your attendants' luncheon or party. Prepare a schedule for the entire day and evening of the party and make plenty of copies for others. Make a list of all items you need to take to the party. Make up a basket of personal items for the ladies washroom in case your guests need anything on the day of your wedding: breathmints, dental floss, safety pins, a small sewing kit, hairspray, mouth wash, sanitary items, aspirin, hand cream, antacid, and any other small items needed in case of an emergency. Also put something together for the men's room: a shoe shine towel, antacid, aspirin, safety pins, mouthwash with small paper cups, dental floss, breathmints, and any other items that will assure their comfort and convenience. Have final consultations with all vendors Prepare checks and tips for vendors, place in envelopes for the day of the party. Delivery all items to the planner or caterer that need to be in place at the reception (bathroom kits, napkins, matches, etc.). Pack everything you need for the next day. Lay out your clothes and accessories for the big day. Relax, is the order of the day, enjoy a massage, a manicure and pedicure. Attend the rehearsal and dinner and remember to have fun! Turn in early to get a good night's sleep! Allow plenty of time to have your hair and makeup done. 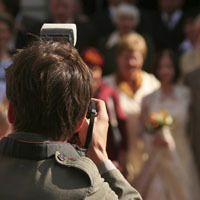 Allow time for any photos before the ceremony. Make time to have a nice chat with your parents before the ceremony. If you are able to dress at the ceremony site do so, but be sure to give yourself plenty of time. This is a day you don't want to rush. Relax, and remember: This is your special day, the result of your careful planning. Take a deep breath and savor every moment. Refuse to let any glitches get to you. Let your joy and happiness shine through.